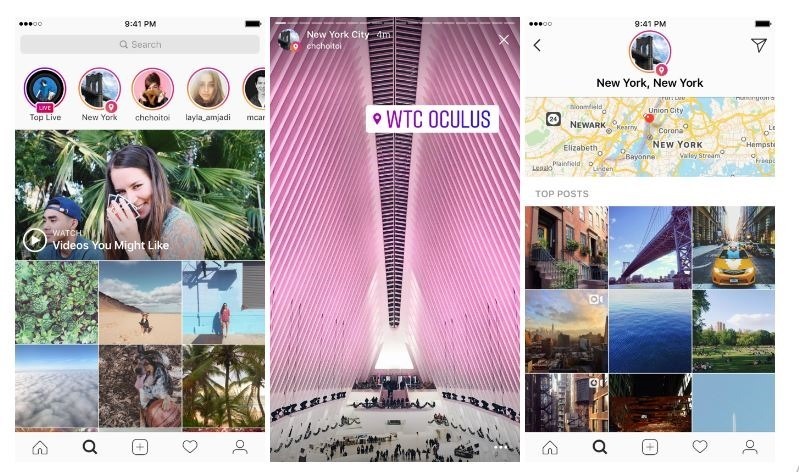 Instagram’s story feature has become very famous in the last six months, and it has become an advanced version of Snapchat now. The company recently announced photo filters and stickers like those in Snapchat, to make the experience more engaging. Earlier, Instagram allowed you to tag someone in a story, using @ and then the Instagram handle of the person’s account. On tapping the tag, you would be able to check out the person’s Instagram page. Now, the same logic has been applied to locations and hashtags. From today onwards, you will be able to search for Instagram stories basis their location tags and hashtags. In case you want to search stories about New York City, just search for it in the search tab and you’ll see a new ring which has all the stories associated with it. “You’ll see a new story ring at the top of Explore filled with stories happening near you. These stories come from people who have used location stickers on their stories. You can also search for any location around the world, and you’ll see a story ring for that place at the top of the location page,” says the company’s blog. Instagram is also beginning to introduce hashtag stories on Explore to help you find stories related to your interests. When you search for a hashtag, you may see a story ring at the top of the page filled with stories using that hashtag. In case you want to search stories about a particular location, go to the Explore or search tab and search for the specific place. When you select the location, you will see a circular figure at the top next to the location’s name. Clicking on that will take you to all the stories with the specific location tagged. The same has been done for hashtags. Selecting the ring at the top will take you to all the stories related to that tag. For example, you want to search for a trending hashtag, search for it in the explore tab and you will be able to see all the visible stories. Hashtag stories will be rolling out in a phased manner in the near future. Add a location sticker or hashtag to your story and you may be included in the larger story. If your story is added, you’ll see a line at the top of your stories viewer list showing how many people saw it in the larger story. If you want to use a location or hashtag sticker but don’t want your story to appear on Explore, tap the X on your stories viewer list. I see this feature being used by a lot of people to let their followers know where they are regularly and join the hashtag bandwagon. A lot of people usually delete their Instagram post if they find that it did not gather enough likes and comments. To counter this, Instagram is adding an archive feature which will temporarily remove the post from your profile. With this feature, users will be able to bring back the post in case they want to in the future. This was a much-needed feature that took too long for the company to launch. The archive feature will be an option on the top right of your post with the three dots. The company wants users to keep uploading photos and save them for the future, rather than delete them altogether. It not only allows the user to reverse the archive but also preserve their older posts. "Now, You Can Search Instagram Stories by Location & Hashtags; Post Archive Option Coming Soon", 5 out of 5 based on 1 ratings.